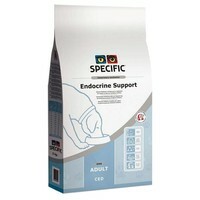 Specific Endocrine Support CED Dry Food for Adult Dogs is for the nutritional support of dogs with diabetes and other endocrine disorders such as hypothyroidism and Cushing’s disease. Formulated especially to cope with these disorders, the food will help your dog to maintain healthy blood levels of glucose and lipids, normalise blood pressure and support the immune response towards recurrent infections. Wheat, Maize Protein, Oats, Powdered Cellulose, Fish Oil, Potato Protein, Fish Meal, Beet Pulp, Hydrolysed Poultry Protein, Minerals, Vitamins and Trace Elements, Eggs, Psyllium Husk, Borage Oil, Yeast (Source of Beta-1,3/1,6-Glucans), Taurine, L-Carnitine.